I’m so excited to be almost finished with another diary. This is the longest one I’ve transcribed to date and I have November and December left to finish. But my excitement is getting the better of me. 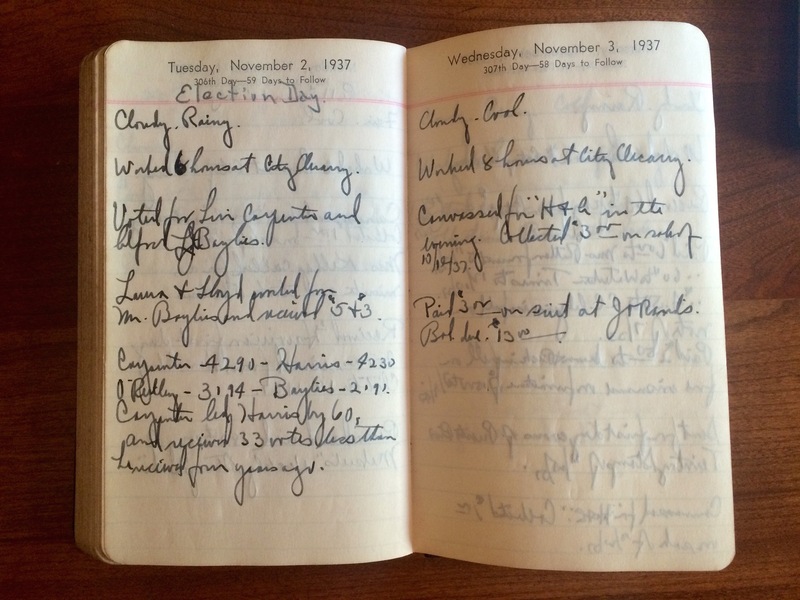 Henry Gilbert kept this diary in 1937 – the details of his immediate family are included in it. He likely kept others; he refers often to things that happened “one year ago to-night” or “25 years ago to-day”, he must be referencing something. Henry was and avid stamp collector. He worked at the local quarry and sold insurance. The Gilbert’s did not appear to be “well off” financially but certainly got by in the depression age. Henry never missed church on a Sunday and was highly interested in local politics. This page will take you to an overview and from there you can read the transcription of Jan – Oct, 1937; download a PDF; or view a list of names in the diary. The PDF and transcription will be updated as the diary is completed. Let’s hope we find some interested ancestors of Henry’s. Wow! fascinating and sad. What’s so great about this diary is his comments on current and past events. There is so much history here. Thanks for the link! Wow, that’s what I wass exploring for, what a data!